The Hannaford City Park is located one block off Main Street to the west. 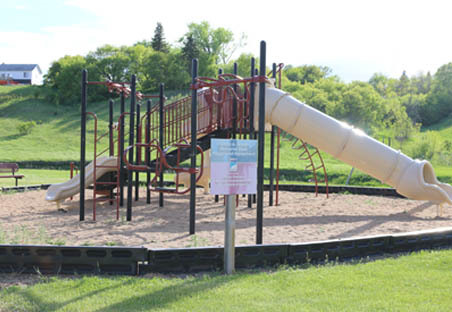 It features playground equipment, restrooms, and a picnic area. CAB Park is located 1/4 mile east of Hannaford. This park has been named after Clinton A. Brown, who was a long time resident of Hannaford, and a great supporter of the park. CAB Park has a sand volleyball court, picnic tables for campers, benches along the walking trails, grills and fire pits, playground equipment, a swimming and fishing area, bathroom and shower facility, and RV and tent camping sites. The RV hook-ups have access to both electricity, water, and sewer and the tent camping spots have electricity only. The rates for camping are: full hookups $15 per day, electric only $12 per day, and tent camping $10 per tent per day. The weekly rate is $75 and the monthly rate is $200. Camping envelopes are located on the front of the bathroom and shower facility with a drop box to place your payment when you leave. If you have questions about camping or the Park, please call 701.769.2298 or 701.789.1011. The Hannaford area is an excellent spot for water fowl and white tail deer hunting. Please contact David Hook with the Hannaford Conservation and Wildlife at 701.769.2298 for more specific hunting information. Lake Ashtabula is located approximately 9 miles south and 10 miles east of Hannaford. It is situated in one of the most scenic river valleys in the region. Anglers will find abundant fish populations including walleye, northern pike, yellow perch, white bass, and black bullheads. The Karnak Landing is also a part of Lake Ashtabula and is located 6 miles east and 3 miles south of Hannaford. This area includes a parking area and a boat loading dock. Numerous walleyes have been caught in this area in addition to perch and northern’s. CAB Park, which is located along the Bald Hill Creek, is also known to be a good fishing spot and is just 1/4 mile east of Hannaford. Softball/Baseball Complex – The softball/baseball complex is located next to the Hannaford Community Center. It has an outstanding softball/baseball diamond, playground equipment, tennis court, basketball court, volleyball court, concession stand, scoreboard, and an outdoor batting cage. American Legion, T-Ball, and Men’s softball leagues are played here each year. Bowling Alley – Hannaford has a six lane Bowling Alley that offers men’s, women’s, couples, and coffee leagues. The leagues run from September through April. There is also a restaurant that offers short orders, dinners, and a Sunday buffet. The restaurant is open year around.